How can a brick-and-mortar shop compete with and online retailer like Amazon? It’s impossible, unless they offer something Amazon doesn’t have. That’s the value behind RadioShack Labs. RadioShack is looking to bring you innovative products that can’t be found anywhere else. RadioShack is simplifying the process for start-up companies to get worldwide, in-store exposure. 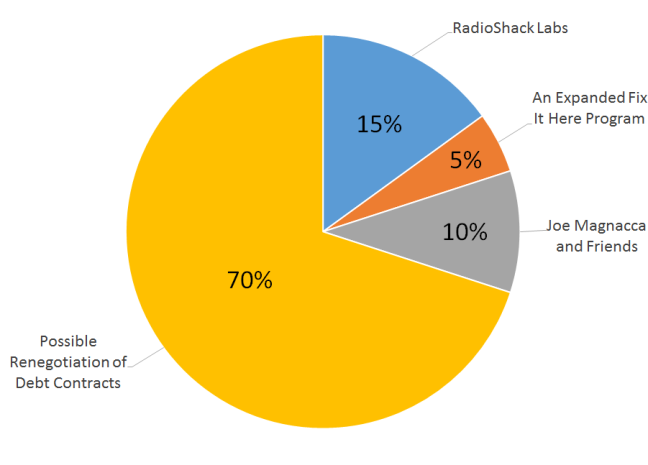 RadioShack Labs offers fledgling start-ups the chance at an unreal amount of instant market penetration. I can see those companies battling for space in RadioShack, all-the-while providing the everyday consumer with unique products that can’t be found online or in any other store. And it just takes one smash-hit product exclusively available at RadioShack to bring people pouring through the doors of their nearby, conveniently-located shop (there are over 7,000 locations worldwide, so you’re bound to find one without much trouble). How can RadioShack benefit before that first smash-hit product, though? Through clever marketing and partnerships. Imagine watching an episode of Shark Tank on ABC. The Sharks are deliberating. They can’t decide if it’s worth investing in a new gadget. A live poll pops-up on the screen asking the viewer if he or she thinks the Sharks should invest in the product. That poll is sponsored by RadioShack Labs. 85% of the people believe the Sharks should invest in the product, but none of the Sharks actually pull the trigger. Immediately after the show airs, RadioShack Labs blogs that the popular gadget will appear in their shops next week, righting the Sharks’ wrong. People are now stopping by a RadioShack every week to see if their favorite Shark Tank products are in-store. Just look around and see how many people have cracked cell phone screens. Enough said. Joe Magnacca has already proven that he can revive a dwindling brand in Duane Reade. He was recently brought-on as a board member at American Apparel to help revive the struggling clothing company. The man’s trusted to find value if any value is actually there. And Magnacca’s list of investor-friends has likely grown quite a bit through his involvement with American Apparel. Big-name investors have been rolling-in to help fund their recovery, and those same investors may find value (both monetary and nostalgic) in RadioShack as well. The last and most important thesis point. RadioShack’s debt-holders refuse to let the company close more than 200 stores per year. If this holds true for much longer, I believe that RadioShack will go bankrupt. The stock market agrees with me and has priced RadioShack stock accordingly. However, the market is treating this wildcard as a fact, giving the company a market capitalization of around $60 million. Any scenario is technically possible, though, and therefore nothing should be set in stone this early. Debt is often renegotiated, and I theorize that some sort of renegotiation will likely occur. RadioShack has a few hundred million dollars in assets (after taking into account their debt load). If the debt contracts are renegotiated (and RadioShack is allowed to close 1,100 stores), their market capitalization should quickly re-adjust to a more realistic value above $100 million. This is where I weigh each thesis point against each other. I base each thesis point’s value on a combination of three things: it’s comparative market impact (in my opinion), it’s likelihood of occurring (also, in my opinion), and it’s overall importance to my thesis. Like always, nothing is set in stone and I will re-evaluate my thesis every step of the way, as the situation evolves.